Ugra is the Swiss Centre of Competence for Media and Printing Technology. The UGRA is particularly active in the areas of control agents and certifications. 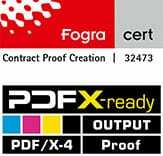 Color accurate Proofs have to contain a media wedge, one of which is developed and published by the UGRA and Fogra. The latest revision is currently the Ugra / Fogra Media Wedge V3.0.